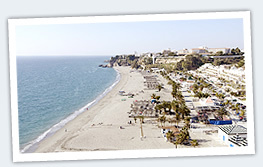 These 9 villas enjoy an unbeatable location in Nerja, close to the exclusive Parador Hotel. They are in a residential location which is just 10 minutes from Burriana Beach and 10 minutes from the Balcón de Europa, the very heart of Nerja. These villas have all the advantages of their central location – shops, restaurants, cafés etc, whilst being within a few minutes walk of the beach, and yet also provide space and privacy, with the luxury of a private pool. These villas are just a short walk from the award-winning Burriana Beach and each enjoys beautiful sea views from their various terraces. Burriana Beach has a range of restaurants, bars and shops, so you don’t have to go far for what you need. 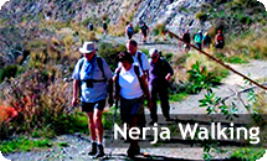 If you want to explore a bit more, Nerja town centre is only around a 25-minute walk away, or 5 minutes by car, where you can find an even larger selection of restaurants, cafés and shops, as well as several more beaches along the Nerja coast line.